Every customer comes in to Signature Iron Doors hoping to get the best quality for the best price. 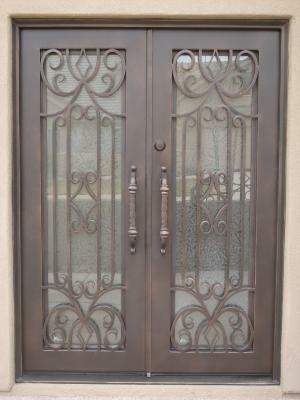 At Signature Iron Doors, we won’t just tell you and hope you believe us, we will show you why. Our technicians work close to our sales team to insure the product you were promised is what you get. A Signature Iron Door is crafted by hand and fully insulated. Your window has the option to be operable and is dual panned and tempered. We provide the frame and locks. Every door is one seamless piece of iron. Featured here is a double door built in our Sedona style for a family in Paradise Valley Arizona. After a quick and problem free order and delivery, they had their door in their home in just a couple weeks. Depending on your needs, you can have a stock door installed in a week or a custom build done within a few months. Cal us and come visit our showroom in Phoenix Arizona to discover the best quality and value iron door you are looking for.